It’s no secret that earning extra money online is pretty awesome. It’s flexible and most of the time you can bring in money without having to leave your home. However, I’d be lying if I said it didn’t feel icky at times to sit on the computer day in and day out. Sitting down and doing online work all day is not really healthy and our bodies don’t like it. When I worked in an office, I literally gained 20+ pounds in two years just due to lack or exercise and spending an extended period of time sitting on the computer each day. This is why it’s great to invest in a standing desk if you do perform quite a bit of online work. Another alternative would be to establish a side hustle that allowed you to remain active while you earn extra money. If you tend to get cabin fever often and realize that extended desk work is not for you, consider one of these extra income ideas that will allow you to be active while you make money. If you like to exercise, you might as well get paid for it. Sometimes exercise takes a back seat when we get busy or overwhelmed with work. If you work as part-time group fitness instructor, you’ll be more motivated to work out because you’ll get paid to do it. Group fitness instructors are not always personal trainers or fitness experts. Many of them are regular people just like you and me who like working out and making extra money. The easiest type of group fitness classes to run are aerobic dance classes like Zumba. You can also teach yoga or a strength class depending on your interests. To become a group fitness instructor, you usually have to undergo training or become certified but the job doesn’t require any extra education like a degree or anything. Some places might actually train you. To find jobs, check online job boards and your local fitness centers like gyms, the park district or the YMCA. Helping people move is not really fun unless you’re getting something out of the deal – like money. If you don’t mind helping others move their belongings to a new home during your spare time, you can get a good workout in and become a part-time mover. MoversCorp is a trusted website that allows you to create an account for free and list your services along with your service area. Then, when a nearby opportunity arises, you can set your own rates and get to work. You can also ask popular nearby moving companies if they’d be interested in hiring a contract worker to help with jobs. Of course with this option, the frequency of work and amount you earn will be varied, but it’s still a flexible way to make more money without being chained to a computer screen for several hours. If you like sports or have kids who play sports, consider getting a side gig as a coach or referee. Some organizations don’t pay coaches especially if they are volunteer parents, but you can most likely earn money by coaching older and more advanced individuals, traveling teams, or teams that are funded by higher-education institutions. Referees are more likely to be paid no matter what the sport is or who’s playing because they tend to work shifts and cover multiple games. Referees can make anywhere from $12-$18 per hour which makes this a great opportunity for someone who has evenings and weekends available which is when most games usually occur. You can search for referee jobs on online job boards like Indeed or Monster, and for coaching gigs, you should check with your local park district, YMCA, or sporting organizations in your town. When summer rolls around, all the local pools will need lifeguards. If you can swim and get CPR certified, you’ll easily qualify for a position. Lifeguards tend to earn a lower wage compared to some of the side jobs so you may want to pair the position with an additional side hustle as well especially since it will probably be part time. This is a fun and easy side hustle that will allow you to get some fresh air and some additional steps in for the day. Dog walkers can easily earn $10 per 20-minute walk per dog so your earnings can seriously add up. Rover is one of the most popular sites to use to find dog walking gigs but you can also sites like Care, SitterCity, and PetSitter to find clients in your area. Don’t forget to harness the power of word-of-mouth. Tell people you know about your dog walking services to bring in more business and put fliers up and ask friends and neighbors if they’d be interested in hiring you. You can walk dogs during your lunch break, before or after work, and on weekends. If you’re obsessed with health and wellness, cash in on your passion and consider becoming a personal trainer. Personal trainers are like motivational coaches for health and wellness and they earn an average of $18 per hour according to PayScale. You could become a freelance personal trainer or you could land a part-time job with a gym or fitness center. Generally, personal trainers must be certified and have some secondary education under their belt but experience is also the best teacher. If you have an inspiring health and fitness story, people will naturally be drawn to you to learn more about how they can achieve the same results. If you’re not a big fan of sitting for long periods of time, don’t limit yourself to just online income opportunities when it comes to earning more. 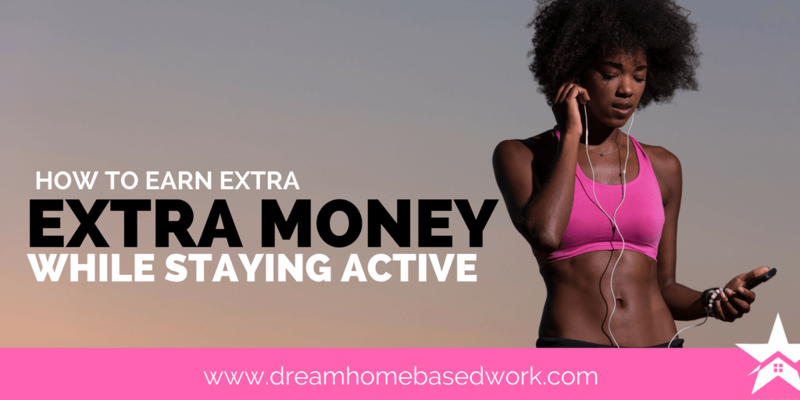 As you can see, there are plenty of ways to earn extra money while staying active and it’s much better for your health. At the end of the day, you can always pair an active side hustle with an online side hustle as well to maximize your earning potential. How much time do you spend on the computer? 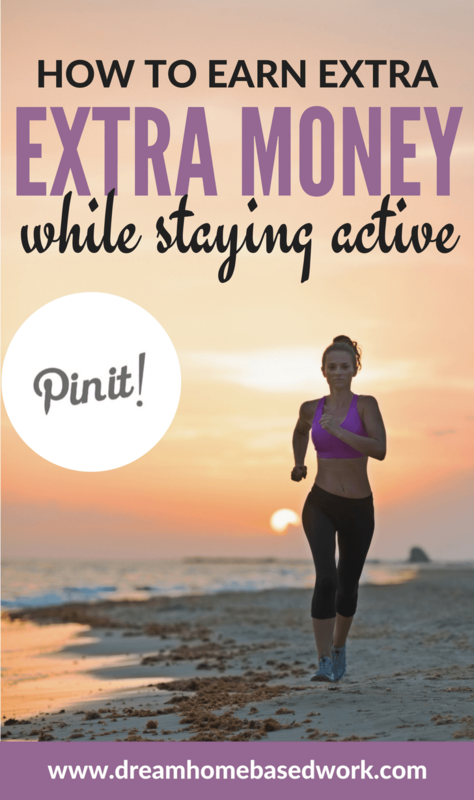 Have you ever considered any of these active ways to earn extra money?